Netflix has revealed the titles for all nine episodes of Chilling Adventures of Sabrina Part 2. Netflix has released a full-length trailer for Chilling Adventures of Sabrina season 2 which gets awfully dark. Netflix has released several first-look photos from Chilling Adventures of Sabrina season 2 ahead of its debut next month. Netflix has released their 2018 Year in Review that looks back on their biggest and best original TV shows and movies throughout the past year. The Satanic Temple filed a lawsuit against Chilling Adventures of Sabrina for misappropriation of their Baphomet statue. Ahead of the holiday, Netflix has released new photos from the Chilling Adventures of Sabrina Christmas special. The Chilling Adventures of Sabrina holiday special is coming to celebrate the Winter Solstice. The Satanic Temple is suing Netflix for the use of a Baphomet statue in Chilling Adventures of Sabrina, but the Church of Satan could care less. The Baphomet statue used in Netflix's Chilling Adventures of Sabrina has made the real-life Satanic Temple angry. Kiernan Shipka reveals that they're already filming Chilling Adventures of Sabrina season 2, teasing that her character changes a lot. Netflix has unveiled the first full trailer for The Chilling Adventures of Sabrina and it adds a dash of humor into the horror mix. Netflix offers an in-depth look at the Spellman family, their friends and foes in the upcoming thriller Chilling Adventures of Sabrina. It's time for Sabrina Spellman to blow out the candles and become a witch in Netflix's Riverdale spinoff The Chilling Adventures of Sabrina. 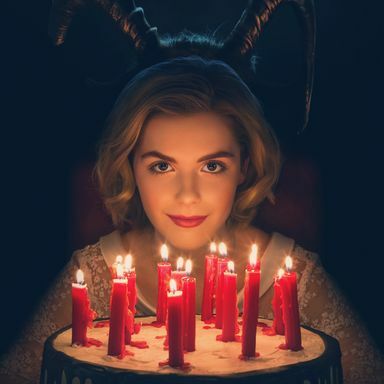 Kiernan Shipka is flanked by Baphomet and birthday candles in a new poster for Netflix's Sabrina reboot.